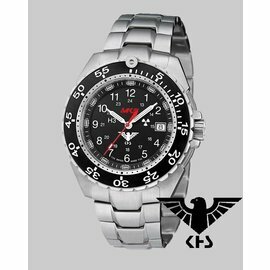 The new KHS Enforcer special operations with ceramic bezel and oversized H3 Pointer, very robust and built in Switzerland (Swiss Made). 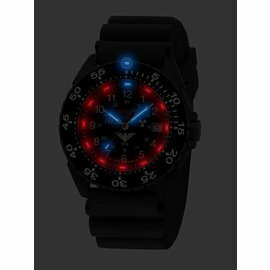 Through the built-up only in the KHS Enforcer novel illumination color scheme "Red Ocean" this sturdy military watch is a real highlight among Swiss Military watches. All ENFORCER models are manufactured in Switzerland and offer the highest precision, in the processing, as well for the movement (Ronda). 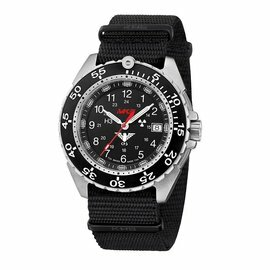 The quality of the case had the highest priority in the nearly 3-year development of new ENFORCER, therefore we use materials, which are also used in the aviation and aerospace, high-quality surgeon stainless steel or an extremely resistant titanium alloy, both are also available with a black PVD coating. For the Enforcer we have designed a new star-shaped case back design. The case back is, as usual, provided with an open space for engraving. This open space can, for example, be used for specifying the blood group or the owner name. In the new model ENFORCER a ceramic bezel is installed for the first time at KHS. Ceramic bezels are usually used by manufacturers of so-called luxury watches such as Rolex, Breitling or Omega. 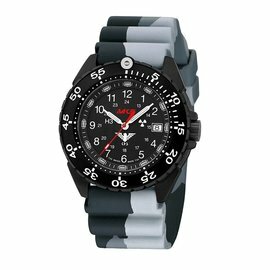 Now we use this technological advantage with great effort for military watches. The ceramic itself is sintered under tremendous pressure at temperatures above 1500° Celsius. The use of a ceramic bezel for the new KHS ENFORCER is obvious: an extremely hard surface that is 3 to 4 times harder than steel. It is nearly impossible to scratch it! For tactical reasons we choose to carry out the ceramic surface in matt finish and not polished, as do most luxury watch manufacturer. Reflections on the matte surface are thus almost completely impossible. All models offer 3 hands (hour, minute, second) as well as a date display at 3 clock. The dial design has been revised to the previous series "Tactical Shadow" and "Commander Titan" for even better and especially faster reading. As a tribute to the predecessor series, a red MK3 logo is now placed on the dial. As almost all other KHS tactical watches the new ENFORCER uses a red second hand for tactical "to the second"-operations. It was obvois, that we use a sapphire crystal for new KHS ENFORCER! On the glass bottom, the glass is provided with a anti-reflecting polish. A vapor-deposited anti-reflection coating of the outside we have intentionally not implemented, as this would scratch over time. We find another new feature in the bezel of the new KHS ENFORCER. The built-H3-light, the so-called H3-pointer, is the biggest H3-pointer in a H3 military watch worldwide. No other manufacturer installed a greater H3 light at this point. Our competitors mostly use standard pointer with a diameter of 1.7 mm, our predecessor series of new ENFORCER, the "Tactical Shadow" and "Commander Titan", already used Pointer with a diameter of 2.7 mm, the new H3-pointer in the new ENFORCER is fabled 3.85 mm in diameter! The new H3-pointer is now even more perceptible in conjunction with the other lights of the H3-clock. A huge improvement, especially in tactical situations where it depends on the exact timing. 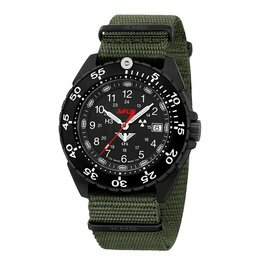 With the new ceramic bezel and the new XXL H3-pointer we go a big step forward and set a new standard for military watches with these two new features. Just as in the previous model series "Tactical Shadow" and "Commander Titan" we use in the new ENFORCER original H3 gaslight lamps (Trigalights) from Switzerland. For the ENFORCER a new H3-color system with the name "Red Ocean" with red and blue lights is exclusively installed in the KHS ENFORCER.